We’ve talked about remote access to your home or office DESKTOP before. But sometimes you just need access to files on your hard drive. Let’s say you have taken some property photos for a client’s listing. You uploaded them to your home or office PC from your digital camera. But now you are at the client’s house and forgot to bring them with you. Enter FeelHome. FeelHome is a free service that gives you remote access to your computer hard drive from ANY web browser, PC or MAC. All you need to do is create a free account and install the software. It’s that easy. Once you have it all setup, you only need to do is login using any web browser. All communication between the browser and your remote computer is SSL-encrypted for security. And since your files are never stored on the FeelHome servers, there is no need to worry about having your sensitive files being stored on any other system. Once you have logged in, you can browse and download any file stored on your computer, including those on the hard drive, network drives, USB drives, and even thumb drives. Any file can then be downloaded to the remote PC you are connecting from in just a few clicks. Let’s say you have a home computer and a work computer and you need remote access to them both. 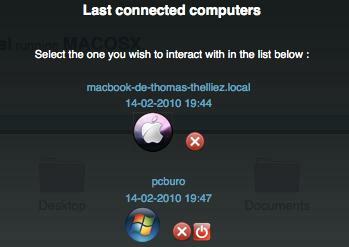 Simply install FeelHome on both of them under the same account, and when you login to your account from a remote location, FeelHome will ask you which computer you wish to connect to. No need for multiple accounts and logins to remember. While the service is technically still in BETA, it’s still a great way to grab files that you may have left on your computer. It’s free — how much easier can it be? Previous postMy home is in trouble! How do I find a good agent? The one factor I detest about the ipad is the fact that you can’t see flash content. That’s I beleive the tabs with Android operating system are a superb alternative… even when the Android working system drains your battery like crazy.